Yes, I've found a new peanut butter to love. It's 'Maranatha No Stir Organic Peanut Spread With Calcium'. The creamy style. '85% Peanuts.' Which guess makes it a spread and not a butter. Some of the ingredients are a bit of a surprise: sea salt, unrefined cane sugar, and palm oil. It's kind of the consistency of Nutella, so you could pour it slowly onto a sundae or whatever. I like about a teaspoon on a piece of whole wheat. Straight up. I found it as I found a lot of these little tidbits at HEB on the clearance aisle. $1 for 12 ounces. It's a shame, as the stuff I find is often really good, but not a big name. Click here for the company site. Do any of you Sport Clips customers find it ironic that it's supposed to be geared at guys but they put 9 hair products in your hair, offer massages, shampoo, a hot towel then try to sell you a hair care system? But all that's on TV is ESPN HD. I mean if you're going to send a mixed signal, half of them ought to be showing Lifetime HD. Yes it works, yes it's no comparison to a desktop as expected. I got 47fps standing in a small building with one MOB in Everlook. This is with everything dialed down and no addons. Running around Everlook gave 10-13 fps, and outside in the zone on a mount got about 20-25fps. I used the native 1024x600 eee LCD resolution. Uncheck the option to use 3D sound hardware and turn the sound quality to low. The 900 series uses a GMA915 Intel chip, so it's even worse than a GMA950, and the 900mhz processor doesn't help. On that note, I recommend one of those laptop pads with a fan built in to place your netbook on, if you are going to game much. It will keep your laptop cool. WoW will max the processor at 100% on Windows XP. If you just want to do the auction house, check your mail, hang out, reposition your character, etc. it will work. You sure won't be doing any raids of course. You might solo a mob or two, but a crowd would bog you down. Summary: It could be useful, depending on what you're doing. Note to Blizzard: Would it be possible to dial things down even further? Maybe some really ugly graphics in exchange for increased speed? Not a total redesign, but maybe turning down the polygon count somehow, turning lighting and effects off entirely, polygons but no textures mapped? 'The Unit' is playing on the TV at Dairy Queen. They are doing backroom surgery on some dude in the scene. Blood, some sort of small device involved...spy stuff. I told the wife "Just what I want to watch while I eat my cherry laden Blizzard." I suppose it's no worse than what I can see going on back in the kitchen. Follow on: My wife got the wrong Blizzard, so she went to give it back. The guy asks: "Did you eat any of it?" She says no. He puts it in the freezer. Sooooooo many possibilities. Hopefully it's some sort of accountability thing? Short summary: Where's the next closest Dairy Queen? Aerosmith to have another femal lead singer? 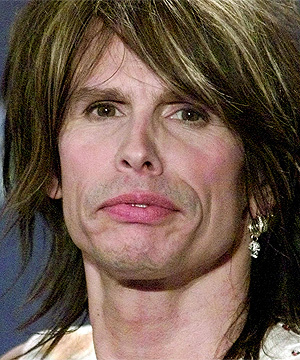 I heard on the radio that Aerosmith was looking for a new singer. Joe Perry did not rule out the idea of having a woman as a singer and I was thinking: "Didn't they have a skinny ugly woman for years?" She sure could sing though.